White Lake, Tsagaan Nuur. This is the only boat I saw on the lake. I learned that tourists do come to fish, though I didn't see any other vessels during my stay. Our visit to the Dukha reindeer herders in northern Mongolia began and ended in Tsagaan Nuur sum. After an 11 hour ride in a Russian Furgon van we checked into our guest house. The road was unpaved and we crossed over small rivers and streams, passed herds of yak, cattle, sheep, horses and goats. We saw occasional gers and people on horseback going to or coming from either Murun or Tsagaan Nuur. There was a stop for lunch at a ger canteen in Toom and a quick visit to a friend in Ulaan Uul. 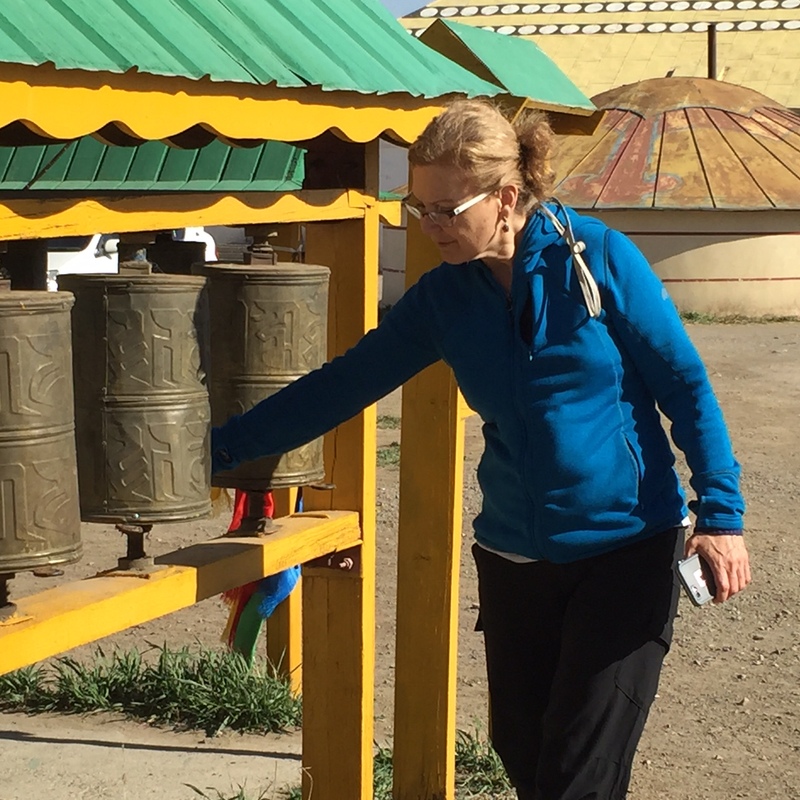 Our all female Team Nomadicare left Tsagaan Nuur for the east taiga on June 1. A Russian made Furgon van delivered us with our gear to Hogrog where our horses and wranglers were waiting. Once at the reindeer herders' camp, we moved into our accommodations, three people in a tourist urts (Siberian tipi) and two in tents. The next day, we arranged visits with the reindeer herders where we distributed hygiene kits to every family and updated our database. 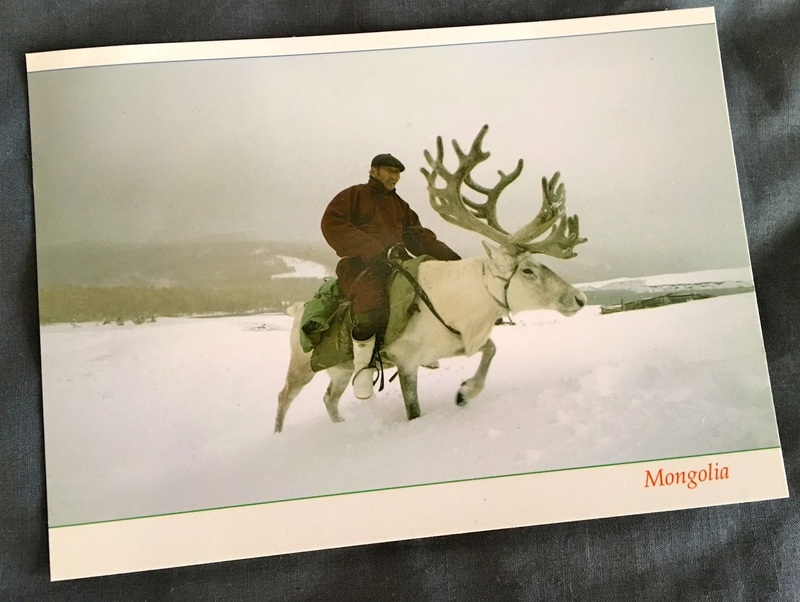 In the north of Mongolia, not too far from Russia, I just completed a small research study on tourism among the nomadic Dukha reindeer herders of the East and West taiga. This community moves four or more times a year taking their animals to fresh pasture. When not interviewing their parents, my interpreter, Chuka, and I also did some 'day in the life' drawings with the children. I had brought colored markers and paper. I've conducted this exercise in many countries with children throughout the world: kids on Fogo Island in Cape Verde drew volcanoes; children in India their villages in the countryside and their families; in Bulgaria they drew photos of the sports activities they enjoyed, pizza, flowers and friends. Our drive from Murun to Tsagaan Nuur took 11 hours. It was a very bumpy but beautiful ride over dried mud tracks, through pastures of grazing sheep, goats, yak and horses. Our sturdy Russian Furgon forded streams like a vehicle built for the outback. We made two stops on our journey. At a ger canteen in Toom we lunched on hand cut noodles and mutton. While waiting for our midday repast we enjoyed the scenery: one herder was mending her ger behind the restaurant. Across the way, while two small children played in a wooden cart, their family was unpacking their ger and household furnishings from their winter hut, readying for a move to their summer camp. In Ulaanuul, we visited Sas’s friend, Yura. Another nice reunion with hugs, catching up on news of family and friends. Yura welcomed us with soup and milk tea. Khongorzul with the new blood pressure cuff and stethoscope. Today was filled with the happiness of meeting an old friend coupled with anticipation for our trip north. 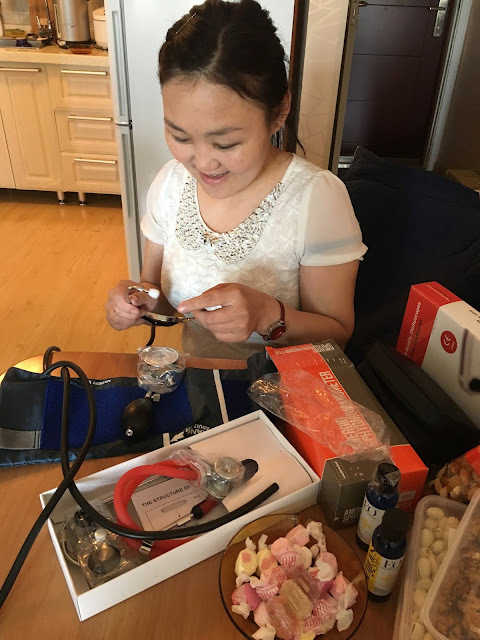 Khongorzul, a reindeer herder from the East taiga who has just completed medical school, stopped by our apartment in Ulaanbaatar to pick up a stethoscope and blood pressure cuff donated by Nomadicare. Khongorzul taking Sas's blood pressure. Of course, Khongorzul immediately tried out her new gifts and took Sas's blood pressure. During her visit, Sas and Chimedee and Khongorzul caught up on news of family and friends, reminisced about past visits to the taiga, and talked about the future. Afterwards, Sas and Khongorzul discussed Nomadicare's seven-year health database of the reindeer herders, pointing out various health issues that seemed to appear frequently such as dental problems, high blood pressure, and joint and back pain. When riding their horses herders sometimes fall off. Since they don't wear helmets, they are at high risk for concussions. I asked how often the herders see a doctor - I was thinking about the regular check-ups we have in the US - and Khongorzul laughed and said that they only go when they are really sick. Looking at the health database. Sas mentioned later to me that it may also depend on the location of the camp. In the summer, reindeer herders generally migrate farther away from the sum (county) center where the doctors are located. Khongorzul also told us that the oldest active reindeer herder now in the East taiga is 62. When they get older, most reindeer herders move to the sum center. In the West taiga, one elder woman is still living a nomadic life at 78 despite being blind. Khongorzul would like to practice medicine back in the taiga but currently there is no open position. Watching the trailer for "Migration"
Sas also showed Khongorzul the trailer for "Migration;" she is the first reindeer herder to see the film. It was very moving, so much so that tears were shed. In particular, she loved the Tuvan music. It is possible that Khongorzul will be in the taiga during the time we are there. Good! We look forward to another reunion. We are nearly packed. Tomorrow, Chimedee, my translator Chuka and our driver Munkhuu will leave in the morning for Murun by car. Sas and her camera person Urangoo will fly. On Monday we will go to Tsagaan Nuur, again by car. On Tuesday we drive to a meeting place for our horses and with the help of wranglers will travel to the spring camp of the reindeer herders. Last night Sas and I had a very nice dinner with the resident director of the the American Center for Mongolian Studies (ACMS), Marc Tasse. Sas and Marc discussed possibilities for showing "Migration" and "Ceremony" when we return to Ulaanbaatar. Summer is a busy time and several university groups will be coming to Mongolia on study tours. These groups get much assistance with their in-country travel from ACMS. There is a complete list of seminar topics on their web site. This evening we will had a quick dinner with our team. Tomorrow early, off to the taiga! Food shopping - rice and noodles. 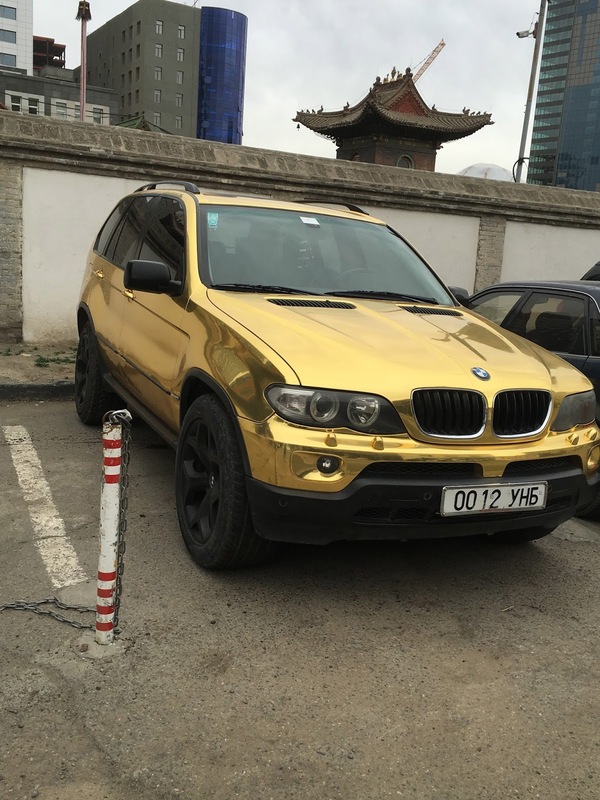 Just for fun, a gold BMW. 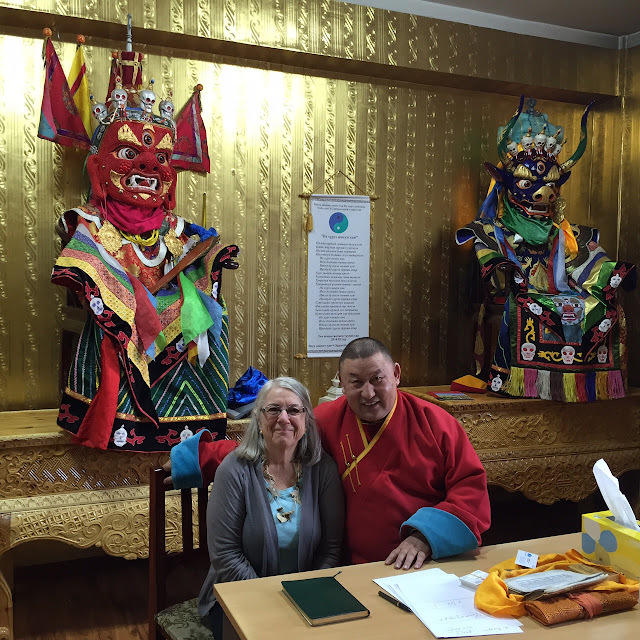 Sas in Ulaanbaatar with her old friend Head Lama Sanjdorj. The women of 'Team Nomadicare' are making progress towards our Sunday departure to the taiga, the boggy coniferous forest of high northern Mongolia where about 250 Dukha still herd reindeer. With years of experience, Sas knows what we need and organizes everything in an efficient and calm manner. She also puts great thought into the items we are bringing with us to distribute, keeping in mind her heart connection with the reindeer herders. The hygiene kits. The bags were made in the local market. Sas and I cut and tied the twill that will be used for reindeer harnesses. 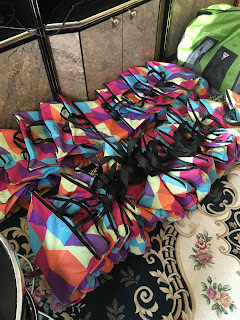 Chimedee and I packed the hygiene kits for each family with twill, toothbrushes and toothpaste, sun screen, candles and matches, soap, fly paper and lotion. 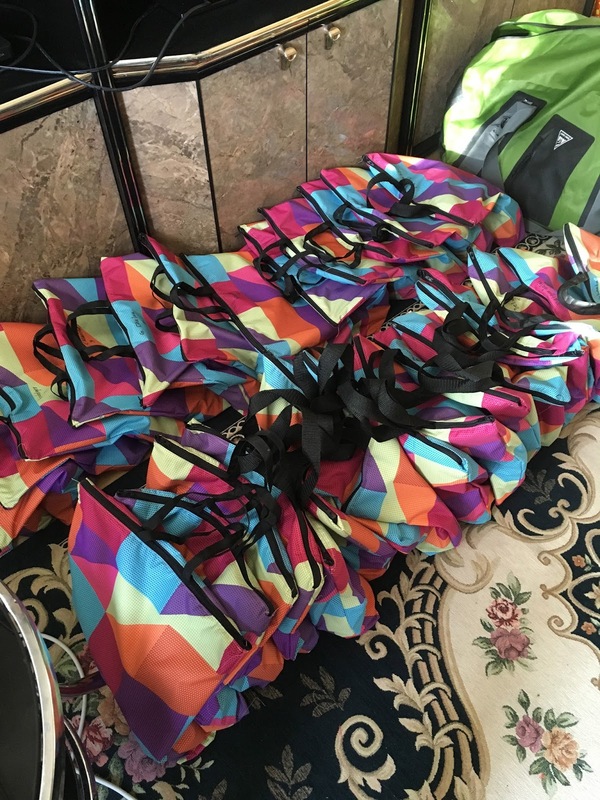 In total there are 23 families in the East taiga and 30 families in the West taiga, as well as five bags for Tsagaannuur Sum Center. Nomadicare's Ulaanabaatar resident board member, Munkhjin, came by for a visit with a gift of delicious Mongolian yogurt and tomatoes. All permissions and registrations from border control to the Hovsgol and Mongolian immigration are now completed. In addition, Nomadicare's shopping continued. Dental instruments for pulling teeth, Novocaine and syringes were added to the supplies for the taiga and will be delivered to the local doctor. Dental health is a concern for the adults and children. Sas and her camera person, Urangoo have examined all of the camera equipment and accompanying accoutrements of batteries, microphones, tripods, cords, etc. in preparation for interviewing reindeer herders and shamans as well. On her last trip to the taiga in 2014, Sas filmed the reindeer herders migration from their Spring to their Summer camp. It is hoped she can show everyone who participated the finished film, "Migration." This trip will focus on recording the lifestyles and concerns of shamans and reindeer herders "in their own words." In particular, we will see what impacts tourists and others (including Nomadicare ) have made on their traditional norms values and health. These nomadic pastoralists live in harmony with their animals and the land: their migrations throughout the year help sustain the biodiversity of this unique landscape. Keeping life in balance maintains the bonds that reindeer herders have with their network of friends, family and other world connections. Following traditions, honoring the land and ancestors, means health and a good life. Sas checking the cameras and microphones with Urangoo. Why are these interviews important? In addition to the the very real need to document cultures threatened by the incursion of globalization (capitalism, mining), studies show tourist visits to indigenous communities may lead to exploitation, objectification and commodification of traditional roles and practices. For example, tourists bring exposure to much needed but also potentially maladaptive resources. While eco-tourism efforts help locals obtain money that can be put towards school fees, livestock, health care and other everyday needs, tourists also bring gifts of candy for the children, and vodka and cigarettes for the adults. Specifically, there are myriad blogs of travelers bringing liquor or travel agencies even suggesting that tourists bring candy and cigarettes to the reindeer herders. While appreciated, and in fact expected, these gifts can and often do contribute to poor health outcomes. 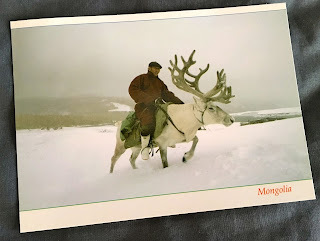 Ganbat on a postcard I found at the post office in Ulaanbaatar. When sick, people use local medicinal herbs, and Western medicine and, if they doesn't work, they consult shamans. Biomedical health care is limited, both in terms of health care practitioners and medicine, whether for everyday pains or chronic illnesses. Also, children and adults alike have little opportunity to visit a dentist, so gifts of candy are troublesome. As for alcohol, once the bottle is opened it will be consumed, a situation with the potential to unbalance relationships. Studies on ecotourism among indigenous peoples show that "a community should benefit socially, economically and environmentally in a sustainable way" (Nault, Stapleton, 2011). To do this the community should have control of the circumstances of tourism in their environment. The Indigenous Peoples of the taiga – who live in the fragile belt of coniferous forest of northern Mongolia – are in trouble. Reindeer herding, which since ancient times has provided a sustainable way of managing the environment and is the foundation of their unique cultures, is in real danger of disappearing. . . Only 200 Dukha reindeer herders remain, many of whom are struggling to ensure a future for reindeer herding in their taiga homeland – a hotspot for biodiversity and rich in natural resources. ... The difficulties of integrating into a market economy, combined with new hunting regulations and increasing numbers of tourists visiting the taiga, are posing additional socio-economic challenges. Climate change is, in many cases, adding additional stress. This situation calls for urgent national and international attention and action to strengthen the traditional livelihood of reindeer herders and restore ecosystems. The report notes that there is "an urgent need to engage with the herders to record and promote their traditional knowledge, as well as to monitor biodiversity and land useage changes that are occurring in the taiga." That is in part what we plan to do over the next few weeks.